At home on April 22, 1995 Hiram "Sonnyboy" Henhawk ago 52 years father of Tricia Longboat & Dwayne & his wife Gloria Thomas, grandfather of Anthony Thomas, brother of Iowne & Maynard Anderson, Vera Styres, Wilma Doxdator, Romaine & Martin Bomberry Norma & Randy VanEvery, Sarah Ann Jones, & Jerry MtPleasant. 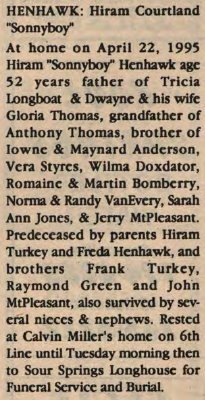 Predeceased by parents Hiram Turkey and Freda Henhawk, and brothers Frank Turkey, Raymond Green and John MtPleasant, also survived by several nieces & nephews. Rested at Calvin Miller's home on 6th Line until Tuesday morning then to Sour Springs Longhouse for Funeral Service and Burial.